The creators of Phineas & Ferb share their wisdom. Dan Povenmire and Jeff ‘Swampy’ Marsh are two modern-day heroes of American animation. Their talents span drawing, animating, writing and producing, and they even write their own songs. While they’ve worked on top programmes like The Simpsons on Fox and Rocko’s Modern Life at Nickelodeon, they’ve also created their very own shows for Disney. 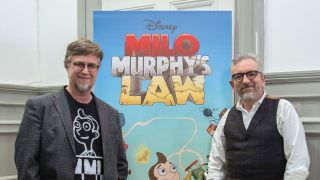 We caught up with them at the launch of Milo Murphy’s Law and asked them to share their top animation tips. "I doodle all the time, and once I got a phone with a camera on it, I think it helped me a lot, because now I take pictures of every doodle I do," says Povenmire. "I also ‘favourite’ all the ones that I like and go back to them later on. "A lot of the characters in Milo Murphy’s Law were drawings that I’d done years earlier, like the character Decker, who is played by Christian Slater in the show. When we found out that he wanted to do a voice, I went back in my phone and found the doodle, and was like: ‘This guy!’"
"Watch Nick Park," Marsh advises. "He has mastered the art of making the inanimate object appear to think. The moment things become real is when you can believe that these characters are thinking. It’s not how big they smile or how fluidly they move, it’s when you’ve created the illusion that the character is processing information, and that’s that magic moment. "I was watching Creature Comforts and just went, ‘Oh, my God, he’s nailed everything.’ You watch the Brazilian Puma, who’s sitting there on the log, he’s like, ‘Where I would like to live, and spend most of my time…’ He’s out there, he’s thinking, he’s imagining, he’s seeing things from the past and the future and you go: That’s alive. That hunk of clay is now totally believable because he’s imagining, he’s remembering, he’s thinking." "If you do angry eyebrows and a happy face, it looks evil," says Povenmire. "If you do angry eyebrows and a sad face, it looks angry. If you do happy eyebrows and a sad mouth, you get perplexed. If you do sad eyebrows and a happy mouth, it looks like your character is in love. "You can do all these different things, and then within that you can use the eyelids to change an expression entirely: between wide-open eyes for an evil expression, and half-open eyes for a dopey expression. "It’s like Candace, the sister in Phineas and Ferb – she’s pretty happy right up until you put the eyebrows in, and then she’s screaming at her brothers. Up until that moment it’s, ‘Aaaah!’ and right then it becomes, ‘You are so busted.’"
"If you think of Bart Simpson, his head is a cylinder, a Coke can," Marsh says. "Draw it, and turn that character in three dimensions. If he turns his head a certain way, you get a bigger circle on the top of his head and a smaller circle where his mouth is. "If your character turns and moves in three dimensions in a way that feels solid, people believe it a lot quicker. That’s the big thing that I learned when I started working on The Simpsons – how to construct things in a three dimensional way." "In Phineas and Ferb, what’s funny is that our protagonist Phineas and antagonist Doofenshmirtz are essentially the same – they’re triangles with two circles for eyes," Povenmire explains. "You can put the hair in and they’re still impossible to tell apart. "But if you add a crooked nose and a mouth, suddenly, one triangle is Doofenshmirtz, whereas with Phineas, the point of the triangle is his nose and his mouth is behind it. They’re very much the same, just as Minnie Mouse is indistinguishable from Mickey – up to the point where you add features and they diverge." "How you handle exaggeration is down to the specific gag, and very much down to your sensibilities." Marsh reveals. "We both have a lot of experience in prime-time animation such as The Simpsons and Family Guy, where it’s all very small reactions, not a lot of exaggeration. "We’ve also worked on big, cartoony shows like Rocko’s Modern Life and SpongeBob SquarePants. They had big, ridiculous events. We tried to meet somewhere in the middle for our shows Phineas and Ferb, and Milo Murphy’s Law. "If you’re more in the middle generally, when you do go want to go extreme, it really plays big and that’s when you get the effect you want." "There’s a standard thing in animation called ‘the antic’, which is really sort of three drawings, put in the right order," Povenmire continues. "So if I draw Phineas reacting to something, he’s going to go from a normal to an alert position. "Something big happens, and he’s got to react to it big. If you just draw the normal pose and then upright pose, it will just be OK. But if you give him the opposite action, instead of his head just going up, you have it go down first and then up, it becomes a bigger reaction to something. "That was something I learned early on when I was trying to animate somebody suddenly running out of frame. It didn’t look good at all until I gave him this whole swing back first – a big, cartoony anticipation of a movement and then have him run off. "You’ve got to have your characters move in the opposite direction first to give it weight." "As much as I believe in the quality of animation, if you’re telling a good story with some strong characters, you don’t need Disney-level resources," adds Marsh. "You have to define your characters really well and know who they are and believe in them. And then, even a stick figure drawing will do. "Think of Nick Park’s The Wrong Trousers, and the character Feathers McGraw. He’s a bowling pin! He doesn’t have any expression at all. There’s no smile. He blinks – that’s literally all he can do. But you know when he’s being menacing and evil. You know when he’s discovered something. He changes the pace at which he walks, and he stops and turns." This article was originally published in Computer Arts magazine issue 266. Buy it here.